4Easysoft Nokia Video Converter provides perfect solution to convert your favorite video files to Nokia mobile phone format with the best quality of picture and sound. This Multimedia Converter software could support almost all source formats, including WMV, MPEG, MPG, ASF, MOD, FLV, RM, etc. In addition, 4Eaysoft Nokia Video Converter also has many advanced function and rich settings for video output. So this powerful Nokia Video Converter doubles your enjoyment of watching videos on Nokia phone. Furthermore, this converting software wills eem easy-to-use to all types of users, both experienced and beginners. · Video: WMV, MP4, MOV, M4V, AVI, FLV, 3GP, 3G2, VOB, MPEG, MPG, ASF, MOD, MKV, RM,TOD, MPV, etc. · Audio: M4A, MP3, WAV, WMA, AC3, MKA, MP2, APE, RA, MID, etc. · MP3, WAV, RAM, AAC, RA audio formats and various video formats like MP4, 3GP, AVC/MP4, 3G2, RM, RMVB. · This Video to Nokia Converter offers the proper video/audio compatible with Nokia 5800 XM Nokia N81, N73, N95, N97, etc. and Nokia E71, E63, 5300, 6300, 8800, etc. · An intuitively designed user interface brings you more convenience and enjoyment. · With professional video encoding and decoding technique, 4Easysoft Nokia Video Converter brings you high speed converting process and impress you with best video quality. All of these will bring you stable and free conversion process. · On the other hand, this video converter has the magic charm to impress users with best video quality. · Trim any segment of your Video to Nokia video by setting the Start time and End Time or dragging the slider bar. · This Nokia Multimedia Converter doubles your enjoyment with joining several interesting clips into one. · Crop off the black edges of video, setting the screen by keep original/ full screen/16:9/4:3. · If you like the current image of the video you just click the "Snapshot" button. The image will be saved , then you can transfer it to your Nokia phone. · Preview movies while editing to get the best movie effects. You cannot download any crack or serial number for 4Easysoft Nokia Video Converter on this page. Every software that you are able to download on our site is legal. There is no crack, serial number, hack or activation key for 4Easysoft Nokia Video Converter present here. Our collection also doesn't contain any keygens, because keygen programs are being used in illegal ways which we do not support. All software that you can find here is freely downloadable and legal. 4Easysoft Nokia Video Converter installation package is prepared to be downloaded from our fast download servers. It is checked for possible viruses and is proven to be 100% clean and safe. 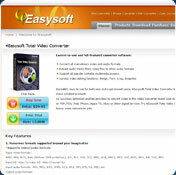 Various leading antiviruses have been used to test 4Easysoft Nokia Video Converter, if it contains any viruses. No infections have been found and downloading 4Easysoft Nokia Video Converter is completelly problem free because of that reason. Our experts on malware detection tested 4Easysoft Nokia Video Converter with various spyware and malware detection programs, including fyxm.net custom malware and spyware detection, and absolutelly no malware or spyware was found in 4Easysoft Nokia Video Converter. All software that you can find on our servers, including 4Easysoft Nokia Video Converter, is either freeware, shareware or open-source, some of the software packages are demo, trial or patch versions and if possible (public domain licence), we also host official full versions of software. Because we want to be one of the fastest download sites on the web, we host all the software including 4Easysoft Nokia Video Converter on our servers. You cannot find here any torrents or download links that would lead you to dangerous sites. Rate 4Easysoft Nokia Video Converter 3.1.06!